Think we just rent school buses? Think again. 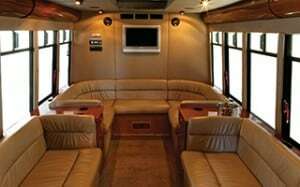 Many groups don’t realize we charter limo style party buses, too! We charter buses for any group, going just about anywhere in Southern Ontario and beyond. Luxury Party Buses are perfect for that special occasion on event and are often chartered for wedding parties, corporate holiday parties, wine tours, group casino trips or night out parties. Enjoy arriving in style where a higher end vehicle is more appropriate or where amenities such as air conditioning is preferred. School buses are a low-cost bus rental option for groups on a budget. Typical groups renting our school buses are not-for profits, school or sports teams, religious and social groups and customers requiring shuttle services for employees around a manufacturing or institutional complex. No matter your group type, needs or budget you can trust you’ll get experienced, professional drivers to make your trip a safe, secure and enjoyable one. See View all our school and party bus types here for detailed information. Chartering a school bus with Switzer-Carty is not just about getting your group to your destination affordably … we drive to keep you safe! Our school and coach party buses are available for wedding bookings in areas throughout Southern Ontario, including; Greater Toronto, Mississauga, Brampton, Etobicoke, Markham, North York, Oakville, Burlington, Windsor-Essex County and surrounding areas. School buses are additionally available in Bradford and Simcoe County.